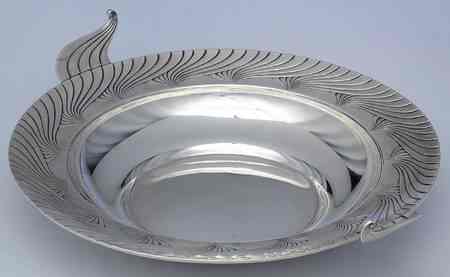 There's growing interest in the individual designers who worked for the big US silver manufacturers in the last century. As late as 1980, many of their names were not even known. Finally, with the advent of the internet, paper patents were put online and important designers in 20th century American silver were identified. One of the best was named Alfred G. Kintz (1884-1963), who spent his entire career at the International Silver Company, headquartered in Meriden, Connecticut. 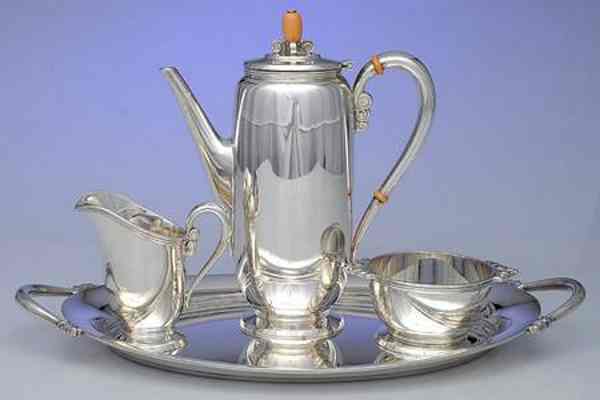 He designed both flatware and hollowware, most of it sterling. He received 45 patents for flatware alone, and designed at least as much hollowware. Kintz could design in any style, and did during his long tenure. In the early 1920s, he produced sterling pieces in some Classical Revival patterns that are still sought after today: Trianon, Pantheon, Theseum. In the Trianon pattern, he designed flatware, tea services, bread and butter plates, and even dresser sets. Colonial Revival has long been a dominant silver style in the US. 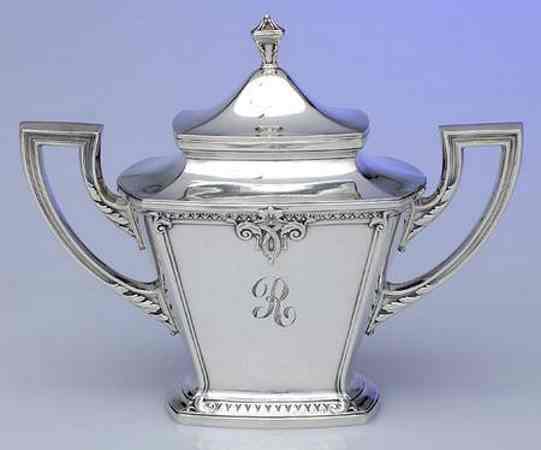 It was inspired by the dignified colonial and federal styles used by early American silversmiths. 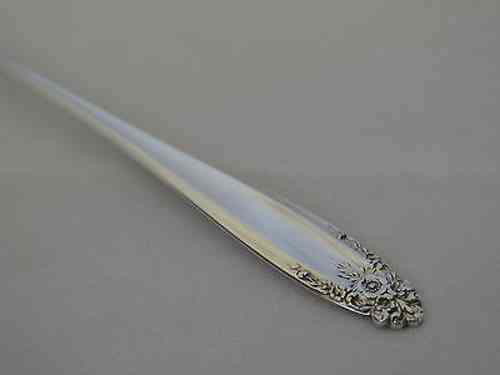 Kintz and another designer produced the 1926 sterling flatware pattern Minuet. It was chosen for the White House by the wife of President Calvin Coolidge. Some of Kintz's most admired work was in the Art Deco style, designed in the late 1920s. In 1929, with a splash of publicity, International introduced three sophisticated sterling hollowware lines by Kintz named Ebb Tide, Northern Lights and Tropical Sunrise (Fig. 4). They were aimed at elite buyers. But they came out just as the surging prosperity of the late Twenties disappeared. Thus they are relatively hard to find today and museums often snap them up. Some of them are in the collection of the Dallas Museum of Art. A vegetable bowl in the rare 1929 Northern Lights design by Kintz. Scandinavian design was popular in the US, especially in the Midwest. In this style, Kintz produced one of the best selling flatware patterns ever made in America. In fact, it's still manufactured offshore from old dies, though International Silver folded in the 1980s. It is Royal Danish, introduced in 1939. He designed hollowware to match as well. 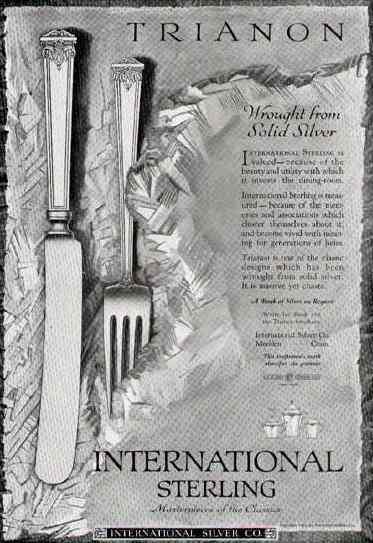 The sterling Royal Danish flatware pattern, 1939. It is still actually in limited production. The same year, Kintz designed another sterling pattern that became famous and much-loved, named Prelude . It was one of the detailed, sweetly romantic patterns issued at this time to appeal to buyers who wanted to emphasize hearth and home during and after the dislocation caused by World War II. Prelude was also produced in hollowware. The flatware is also still in offshore production. After supervisory responsibilities during World War II, Kintz developed a pattern for both hollowware and flatware that combined many 20th century influences. Introduced in 1946, it was given the recycled name Northern Lights, but is a completely separate design from the earlier Northern Lights of 1929. Its plain body and single decorative motif echo Scandinavian design. The fountain-like scrolls repeat a favorite Art Deco device. The modernistic shape of the hollowware even reflects the aerodynamic shapes of bombs and missiles so familiar from the war. And the pedestals on which the hollowware sits bring in a touch of Colonial Revival formality. A demitasse coffee service in Kintz's 1946 Northern Lights design. sterling designs that were introduced seven years apart. the first Northern Lights design sold very few pieces in 1929. Kintz continued to design into the 1950s, receiving his last patent in 1958. In 1959 he retired. His career of almost five decades showed remarkable quality and versatility. He was unusual in another way as well, given the high level of population mobility in 20th century America. He was born, worked, and died in the same modest New England town. 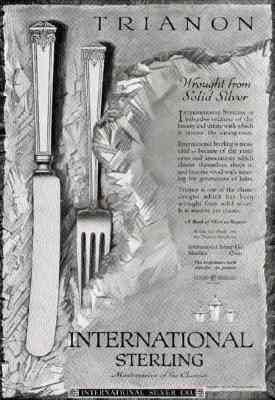 NOTE ON MARKS: The huge International Silver Company began in 1895 as an aggregation of many smaller silver companies that made both sterling and silverplate. It consolidated over the decades but, for the purpose of marketing, it still stamped different lines of silver with different company names/marks - several dozen of them.